I remember well the first time I read Nie's back to school post. I loved it. Everything about it. The family theme, the celebration of a new school year, the dinner, the crowns and the Father's Blessings. I've anxiously awaited the day that both girls were starting a new school year, and that day has finally arrived. After much thought and discussion, we decided on a family theme of Love and Serve. We figure with all that is going on in the world, the perfect thing for our family is to love more and serve more. The menu was simple.. croissant sandwiches, potato chips, grapes, sugar snaps, a little dip, and a capri-sun to finish it off. 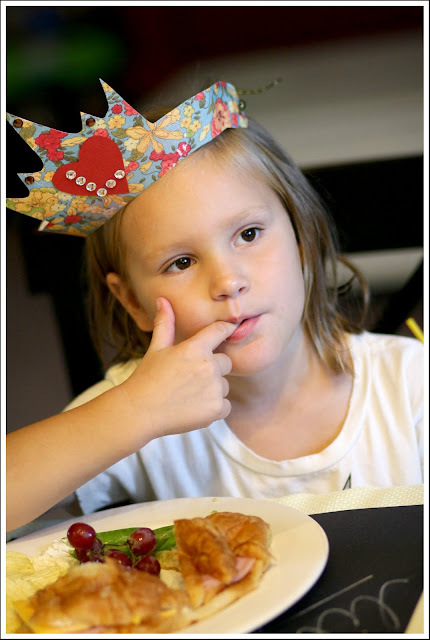 The girls each received their own crown to wear throughout the meal. We talked a lot about what to expect, what they were excited for, what they were worried about. Lily announced she was going to be honest, helpful, tell the truth and be kind. Maybe some of our parenting is wearing off on her. After a quick trip to the park and some cheesecake factory for dessert. We finished the night off with Ryan blessing each girl. It was nearly perfect, just like Nie herself! britt, i love this nie inspired dinner. i want to do one next year, this year no one is going to school. i hope lily is loving her kindergarten class. your grass pots with the love and serve theme are very cool. so adorabe! i love nie's post & think it's great that you've made the idea your own! You always amaze me woman. You're such an example of what it means to be a great Mom! I just came across your blog. 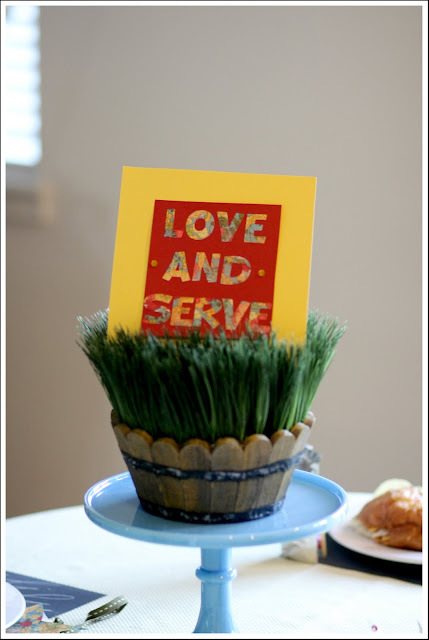 I love this love and serve theme- what a beautiful way to start the school year, by nurturing a generous spirit. What a great dinner. The crowns are darling! "Love & Serve." What a perfect family theme. I hope this year is full of wonder and beauty for your family.